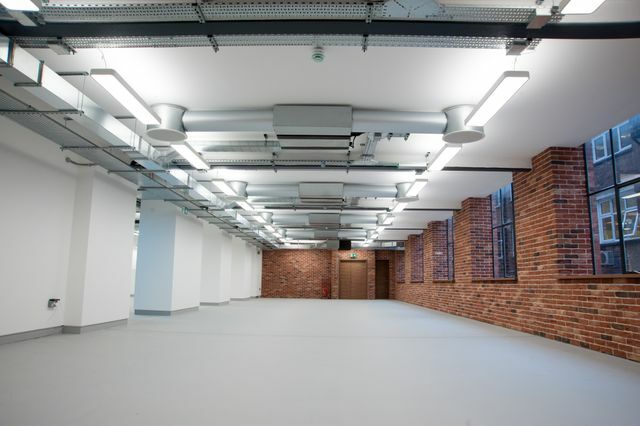 Colin Throp of CBS Design Consultants said "Stephenson Way project comprised exposed services throughout the office areas. To compliment the building structure and the mechanical services the VEW luminaire were chosen with its curved design. During the design, coloured samples were reviewed, culminating in the white finish to blend in with the surroundings. CBS are delighted with the outcome and quality of service Phi have provided throughout the project." Phi Lighting provided it's VEW suspended range. The VEW range utilises its LED technology to provide direct/indirect light distribution and allowing for the remote control drivers to be mounted up to three meters away from the luminaire on the cable trays. The direct and indirect illumination provides an even distribution across the office space. To lessen the visual impact, the drivers were located on the adjacent cable trays.